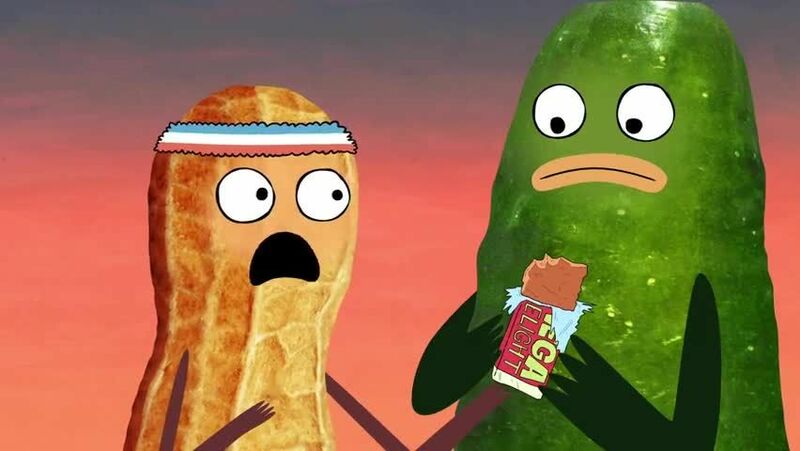 Watch full Pickle and Peanut Season 2 Episode 4 full HD online. Cartoon video Pickle and Peanut Episode 25 online for free in HD. After discovering that an old candy bar in the back of the store shelves contains a coveted golden ticket that grants an exclusive tour of a marvelous candy factory, Pickle convinces Peanut to go with him to claim his prize and give Peanut a taste of some of the factory’s chocolate, only to discover that the factory has been long abandoned, the employees are now hobos living in the factory’s ruins, and the owner of the factory has been missing for years. / Pickle and Peanut are forced by Laser to wash his prized sports car “Funwagon” after they unintentionally splash it with mud. However, they accidentally hose the car down with some toxic ooze from a nearby truck instead of water, and as a result, the ooze grants Funwagon mutated sentience and a freakish face, which ultimately causes a horrified Laser to disown the vehicle. The two befriend Funwagon and decide to “raise it” as their own, until Laser has a “change of heart” and decides to take back Funwagon in order to enter it into a demolition derby for a $10,000 cash prize, which causes Pickle and Peanut to go after Laser in the the truck that contained the toxic ooze to begin with in order to rescue Funwagon from being demolished.